A few weeks ago, I watched Watson win on Jeopardy! and did a couple of Skype interviews for graduate school. It really got me thinking about machine learning and natural language processing, as I’ve been looking for a way to tie in my web development and programming skills with linguistics in a way that will benefit both fields, as well as “regular” people. After coming up with and discarding a number of ideas, a shower thinking session led me to a realization: Universal Subtitles is, in effect, building up a corpus of matched video, audio, transcription, and translation! And, because it’s all open, you can remix and play with the data all you want. So, to do just that, I selected the most translated video (which also happened to be the Universal Subtitles introductory video) and began exploring. At first, I looked at a couple of the translations, thinking about doing something with automatic, statistical translation (which is pretty much what Google Translate does, I believe). But I have very little knowledge of that area, so I hit upon another idea: Extracting the text and the audio and matching it up in Praat—automatically. 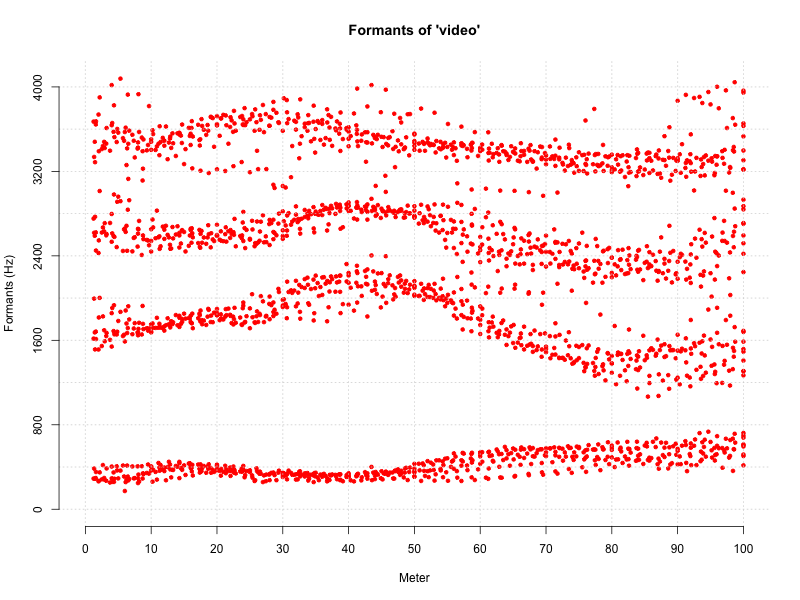 Once I had the text and audio lined up, I started extracting formant info from multiple instances of the word “video”. (It appears a total of 11 times in the introductory video, including once in the compound “videomakers” and once in the plural “videos”.) I later found out that about AntConc, and the concept of concordance in general, which helped to identify other words and combinations of words that appear multiple times in the full text of the transcription. (AntConc contains an N-gram viewer, as well.) Long story short, I recorded the formants of the 11 instances of the word “video” and made them available in this Google Docs spreadsheet. And that’s where the fun started. As you can see in that spreadsheet, I attempted to graph these data points so that I could look at them all together. Unfortunately, all of the spreadsheet programs I tried (basically everything besides Excel, because I don’t have that) could not graph the data points on top of each other, so that one could fully see the similarities and differences among the formant frequencies. I thought I was going to have to settle for that, but then Michael Newman reminded me that R Can Do Anything™. So I finally had my task to help me learn R.
To top things off, the R script that I used to generate the data is available as a gist on GitHub (released under CC-BY-SA), so feel free to remix the data or improve the script. Just be sure to leave me a comment here telling me what you did! Also, any ideas on where to go from here are welcome!